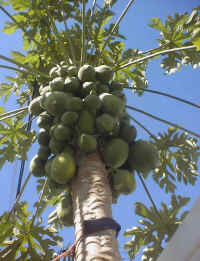 (Papaya - Fruit) Growing a papaya tree from seed can be a fun project for the whole family. We began our papaya tree by selecting a nice large papaya from the market, and letting it fully ripen on our counter top next to the bananas. 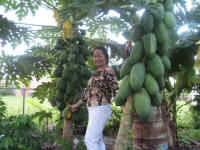 (Papaya - Half) When the large red papaya had fully ripened, and was ready to eat, we cut it in half. We usually save the seeds to make salad dressing, as they have a nice spicy peppery taste, but this time we saved a few seeds to plant in a pot. 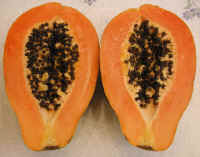 (Papaya - Seeds) As can be seen in this close up look at the seeds, not all of them have fully ripened (darkened). 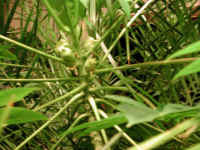 The four seeds we selected for planting were the darkest unblemished ones. We placed the seeds in a 6 inch diameter pot filled with about an inch of drainage stones on the bottom and potting soil to fill the pot to the top. 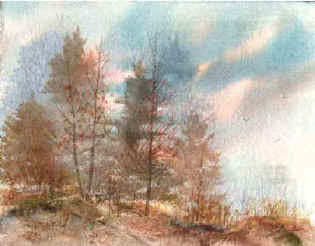 We them planted the four seeds about three inches apart and about one-half inch deep, and gently watered the soil until it was soaked. We then placed the pot beside the window so it could receive plenty of sunlight, and we checked the soil every day to make sure it didn't dry out, as the seeds must be kept moist. 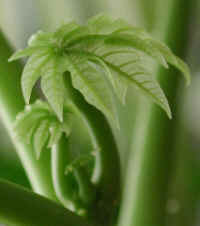 (Papaya - 01) After about a week the seeds began to sprout and grow into a tree with these beautiful seven lobed leaves. 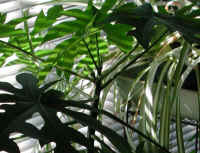 And we were very content to to have this tropical plant growing in our home. 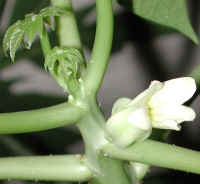 (Papaya - 01a) Then on day we noticed something amazing; there were flower buds growing from the papaya tree's leaf axils at the top of the tree. (Papaya - 02) In this photo we have a better look at one of the papaya tree leaves. 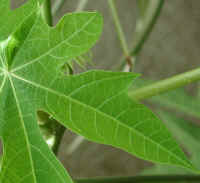 (Papaya - 02a) In this photo we have a closer look at the veining and other details of the leaf construction. 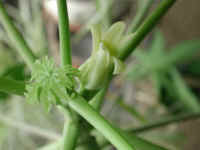 (Papaya - 03) This is another look at the flower buds that grow from the leaf axil of the papaya tree. (Papaya - 03a) At the very top of the papaya tree trunk, we can see the new leaves sprouting, and just below them are the flower buds. 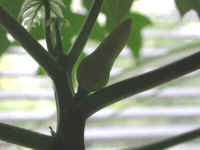 The two buds on the right are just beginning to develop, and the one on the left is fully developed. (Papaya - 04) This is another look at the newly sprouting leaves at the top of the papaya tree. (Papaya - 04a) This is a close up look at the newly sprouting papaya tree leaves. 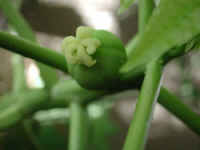 < (Papaya - 05) This is another look at a mature papaya flower bud. 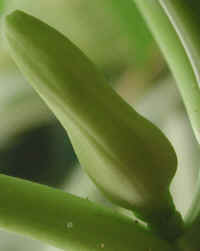 (Papaya - 05a) This is a close up look at the mature papaya flower bud. 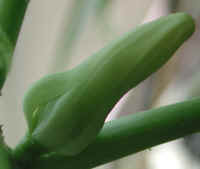 (Papaya - 06) The papaya flower bud begins to open. 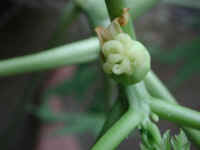 (Papaya - 06a) This is a close up look at the papaya flower bud as it begins to open. 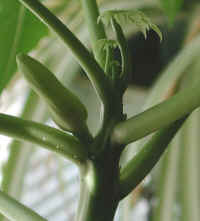 (Papaya - 07) This is another photo of the budding papaya tree. 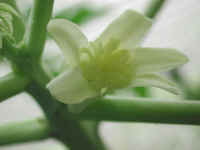 (Papaya - 08) And then, the next day, the papaya flower burst into bloom. 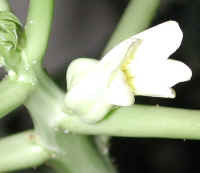 (Papaya - 08a) This is a close up look at the papaya flower. 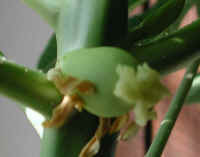 It was very exciting for us to see this tropical tree blooming in our home. (Papaya - 09) This is another view of the papaya tree flower. 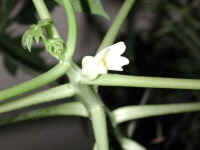 (Papaya - 09a) This is a close up look at the top of the papaya tree with its new leaves and flower. 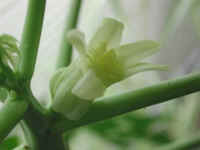 (Papaya - 10) This is a close up look at a fully matured papaya flower. 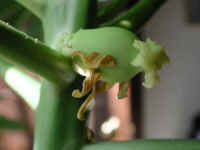 (Papaya - 11) This is another view of the mature papaya flower. 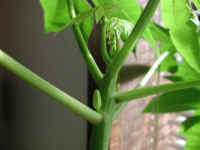 (Papaya - 12) In this photo, we are looking down from the top of the papaya tree at the new leaf growth and the flower. 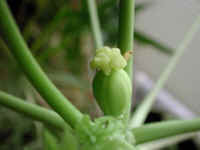 (Papaya - 13) In this photo, we can see that the papaya flower has mostly fallen away, and the ovary is beginning to swell into the fruit. 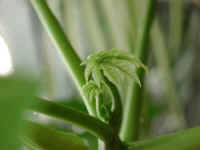 (Papaya - 13a) This is a closer look at newly developing papaya fruit. 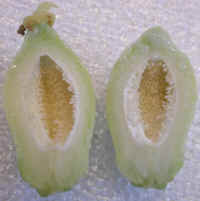 (Papaya - 14) In this photo, we are looking straight down at the newly developing papaya fruit. 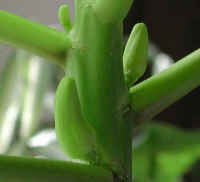 Note the newly developing buds in the leaf axils (below). 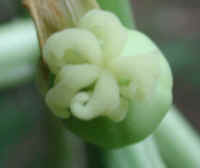 (Papaya - 14a) This is a close up top view of a newly developing papaya fruit. 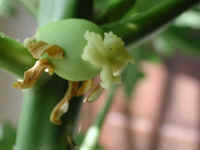 (Papaya - 15) This is another view of the newly developing papaya fruit. (Papaya - 15a) In this close up look at the newly developing papaya fruit, we can see the five pistils still clinging to the top. 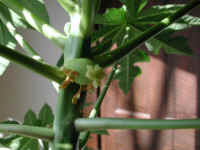 (Papaya - 16) The papaya ovary continued to swell. 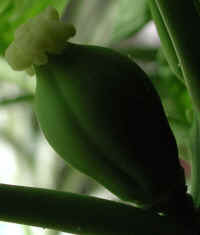 (Papaya - 16a) This is a close up silhouette look at the swollen papaya ovary. 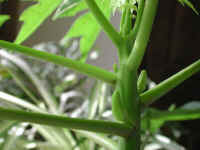 (Papaya - 17) As the papaya tree matured, more flower buds began to develop in the upper leaf axils. 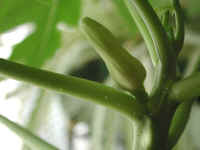 (Papaya - 17a) This is a closer look at the newly developing papaya buds. 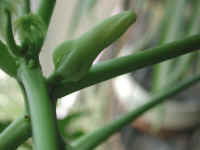 (Papaya - 18) This is another look at the newly developing papaya flower buds. 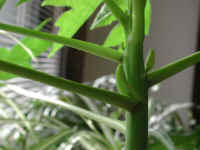 (Papaya - 19) There are almost always new flower buds developing on the papaya tree. 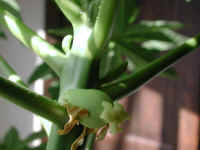 (Papaya - 19a) This is a closer look at the newly developing flower buds. 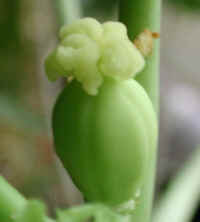 (Papaya - 20) Unfortunately, the swollen papaya ovaries never mature into fruit, because they have not been fertilized by the pollen from a male papaya flower. 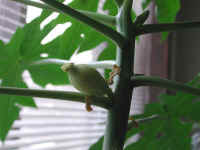 It appears that our papaya tree is only a female. 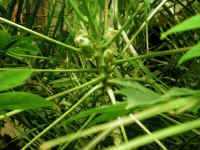 (Papaya - 20a) From what we have learned, papaya trees can be either male or female, or they can have both sexes on the same tree. 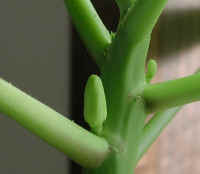 Since our tree is only female, and we don't have a male tree to fertilize the female flowers, the ovaries begin to wither and sag, and then fall off the tree. 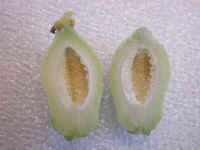 (Papaya - 21) We open one of the fallen undeveloped papaya fruit and it to be a miniature of the mature fruit, except that the seeds have never developed. 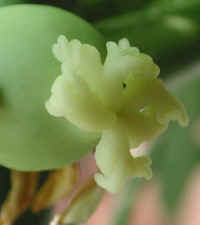 (Papaya - 22) This is a closer look at the undeveloped papaya fruit. 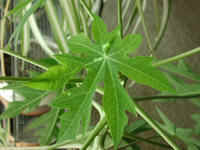 (Papaya - 23) The papaya tree continued to grow taller and produce more leaves and flowers. 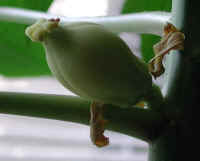 (Papaya - 23a) This is another undeveloped papaya fruit that is ready to fall off the tree. Even though we haven't had any mature fruit from our papaya tree, it has still been exciting to watch it grow, and it has also become a conversation piece for our guests. 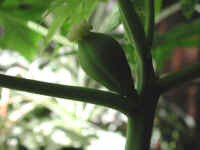 (Papaya - 24) This is another look at the undeveloped papaya fruit. 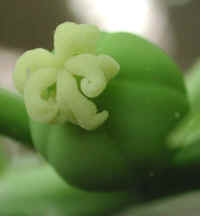 (Papaya - 24a) This is a close up look at the remains of the papaya flower at the end of the swollen ovary. (Papaya - 25) Our papaya tree continued to grow until it was almost as tall as our sliding glass door. (Papaya - 26) This is another view of an undeveloped papaya fruit just before it fell off the tree. 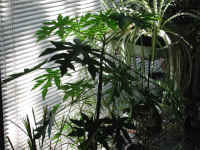 (Papaya - 27) When the papaya grew to the top of the sliding glass door, we transplanted it to the planter in the center of our home. 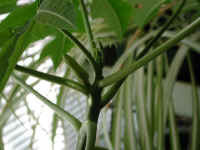 (Papaya - 28) The papaya tree contuned to thrive under the skylights and the Spring of 2007 it was nearly eight feet tall. In the background can be seen the palm bows of our date palms, but that is a story for another photo journal. (Papaya - 029) On 21 Mar 2008, Linda J. Kopie sent us this photo and note: Hi, I planted this tree in my yard in Florida almost 3 years ago. It is 15 feet tall, and I sent you a picture of the fruit on it. I grew the tree from a seed. 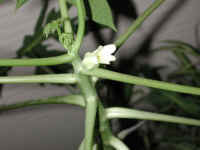 It is so tall, I can't reach the fruit without a 12 foot ladder.